Have you ever submitted a resume through a company website only to receive no response in return? This happens all too often as more and more companies move toward using applicant tracking software systems (or ATS) to screen candidates. Since these systems are not going away anytime soon, we must learn to work with them, so the best rule of thumb is “simplicity” when it comes to your online resume. 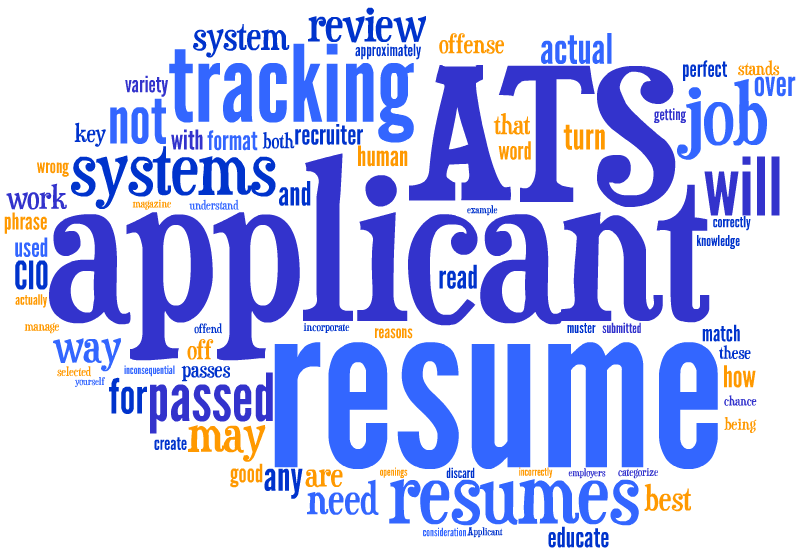 What is an Applicant Tracking Software (ATS) system? An applicant tracking software system is a resume database that helps companies streamline hiring processes and review applications quickly. With the volume of applicants increasing, the majority of companies are moving toward digital systems that track applicants. These systems organize and sort applications and can be programmed to screen candidates based on the content provided in each resume. How do Applicant Tracking Software systems work? When a company posts a new position online using their homepage or job boards, all submitted applications are stored in a database. Recruiters and hiring managers can then search submissions using keywords and phrases to identify candidates that advanced through the hiring process. Many ATSs score applications based on parameters of the open position. Applicants are ranked and sorted based on their score. Basically, the ATS does the first screening for the recruiter/hiring manager. Not all ATSs are alike. Some can handle small graphics, while others cannot. Some prefer PDFs, while others require Word files. Therefore, it should not come as a surprise that your resume is at risk of getting lost in the shuffle if it is not properly formatted and keyword optimized for the ATS system. Step 1 – Answer all application questions completely. Step 2 – Format your resume in an ATS-friendly manner. When applying online, avoid anything that could possibly clog the system – stay away from templates and keep your formatting simple. Title your resume with your name and targeted position. Stick to common headings like Summary, Work Experience, Education, and Skills. Remove images, columns, tables, fields, text boxes and graphics so the ATS can quickly scan your resume for optimized keywords and phrases. The ATS may not be able to read data placed in images, tables, and text boxes, so it’s best to avoid them altogether. Remove special characters and creative/fancy bullets that are often unreadable by ATS scanners. Use common fonts – s tick to Arial, Georgia, Impact, Courier, Lucinda, and Tahoma. Also use black print. Avoid underlining words, which can distort the legibility of lower case letters. Do not allow any spelling errors since an ATS system doesn’t know what you ‘meant’ to write. Include contact information in the body of your resume, not in the header or footer. Save your resume as a basic Word.doc or .txt file. Avoid templates which are a combination of fields and tables and can confuse ATS systems. When writing your employment history, present the information for each employer consistently, i.e., company name, title, city, state, and date, and in reverse chronological order. Step 3 – Focus on your resume’s content. Strengthen your skills section to improve your chances of being pulled by the ATS system. Make sure to include your licenses, certifications, courses completed, and mention any industry-specific terminology (e.g. Salesforce for sales professionals or Oncology for healthcare professionals). Include both the spelled-out version and abbreviations of the same word. Customize your resume and optimize your professional summary with achievements and skills that relate to the job description. Find a natural way to include keywords and phrases in your summary and throughout your resume. Also, optimize your titles based on the job description. If you see “management skills” listed in the job description, make sure you mention your “management skills” in the resume. Ultimately, ensure your ATS-optimized resume is strategically simple, straightforward, and will pass the test of both the ATS system and the employer. That being said, I highly recommend the use of a more visually appealing version of your resume once you’ve landed the interview. If you would like a review or assistance with updating your current resume, contact Michelle Kaufmann / MCK Resume Service at (727) 278-4367 or email: mckresumeservice@gmail.com.